Fabrics designed by Vanessa Bell,one of the Bloomsbury set. This week I visited the Vanessa Bell exhibition at the Dulwich Picture Gallery in London. Vanessa Bell, sister of Virginia Woolf and the lover of artist Duncan Grant, who divided her time between Bloomsbury and Charleston, was multi-talented. She painted portraits and interiors and designed fabrics. I particularly like these dresses showing two of her designs which were for sale in the gallery shop. Also this week I was happy to be called into neighbour Tara's Interior Design shop to see new designs by Designers Guild brought in by their rep. I fell for this cotton fabric, shown above, a mix of painterly flowers and digitally printed real flowers. So pretty! In the window. See credits below. Patricia knitted this little girl's cardigan and baby bootees. 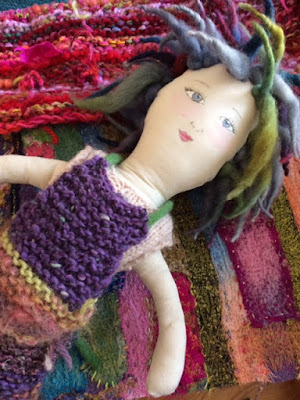 Jenny Drant knitted this FairIsle tank top for a two year old. In the window today are, left to right above, pot by Niloo, wool/cashmere baby bonnet by Patricia, and sugar bowl made by Justine Jenner. Second row: heart felted brooch by Bee Mellor and Jenny Stacy; dimple jug by Justine Jenner and two pure beeswax candles by Elizabeth Eveleigh. Third row: cup by Justine Jenner; embroidered picture by Sheila Barrow and bird jug made by Kate Hackett. Fourth row: Sparkly string 30p a metre; ceramic hearts by Kate Hackett and cashmere bunny by Jenny Stacy. I hope all of you with school age children are enjoying the Easter holidays. A view from The Hangers at Steep near Petersfield. As it's my birthday I decided to choose pictures taken during the last year that I particularly like. In the last year I went with a friend to Paris for a couple of nights. We walked our feet off and I took lots of pictures including the ones above that inspired me then and still inspire me now. I would love to go again, even if only for a few hours. It always amazes me how two capital cities that are so close geographically are so totally different from one another. I love London and I love Paris and I've lived in both places but I find walking in Paris more exciting. A favourite possession: Iris in dyed velvet stitched by Sheila Barrow. These knitted chicks have been selling 'like hot cakes'. Last night I had just photographed these few that were left when a woman came running in and bought the lot. Today I'll phone clever knitter Audrey and see if she can provide any more. My run round the charity shops yielded this green glass vase for £1; a crystal bead necklace - the beads will be used decorate fairies - also for £1 and best of all, an old wallpaper sample book (£2) where all the papers have gold, silver or copper colours in them. I'm imagining these will be great for Christmas paper chains, collage cards,handmade crackers, gift tags etc! If you are following me on Instagram apologies. I've posted all three of these pictures but, as I know that the blog is looked at by many more people than look at Instagram it makes sense. Also I can write a lot more on my blog than is available to me as a picture caption. For example: I remember seeing this velvet picture on Sheila Barrow's stall and just feeling that I had to have it. I think it is so beautiful and well made! Sheila is a gifted textile artist and now, many years after I bought this picture, her work is for sale in Handmade Happiness and Sheila remains one of the most talented people I know. Tear out a page and fold over the torn edge. Fold sides to middle so the edges just overlap. Now fold up the untorn edge to make your base. Sellotape this and your central join. Bags ready to be used and taped shut. Top image Harpers Bazaar, others Country Living pages. Magazines have such gorgeous photographs in them. I hate throwing them into the recycling. 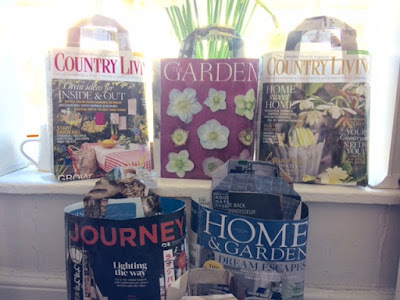 So when you shop in Handmade Happiness in Petersfield expect to be given your purchase in a bag made from a magazine page. Bigger buys go into the carrier bags I make from magazine covers (see earlier post). I use a lot of magazines and nice customers bring me their old magazines now instead of puting them into the recycling bin. So if you see me idly leafing through an old magazine in the shop you'll know I'm not taking a break I'm working! Choosing which pages to make into bags! So today I made her a cotton dress. Dolly is resting on Tanya Williamson's cushions and wearing a gorgeous brooch by Annie Sherburne. 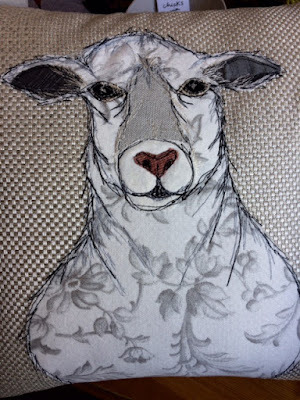 Tanya Williamson sketches on fabric with her sewing machine. Her cushions are special, not least because she uses top quality fabrics so they look and feel nice. Yesterday I was pleased to welcome Tanya to the shop with a fresh batch of cushions for me to sell. If you live in or near Petersfield you might like to be reminded of the Save the Children sale which starts today and goes on until Saturday at the Festival Hall. I've picked up some great bargains there over the years and hope to photograph and share my treasures here with you tomorrow. Delicate pots by Niloo under landscape painting by Christine Burgess. when it's warm and sunny - they'd rather be outside in their gardens or on a walk. Most people don't shop when it's raining or snowing either. So my favourite weather for a busy in the shop day, is cloudy, but not actually raining.